On many policy issues, Democrats and Republicans differ sharply from each other. When PPRG’s survey series began in 1997, just before Bill Clinton and Al Gore hosted the White House Conference on Climate Change, the partisan gap was small. But over the years since then, the partisan gap has grown. 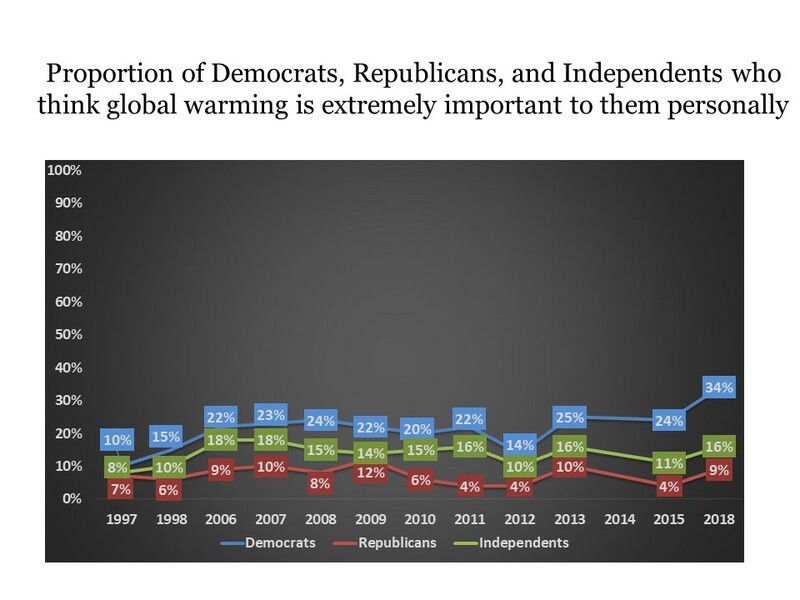 The graphs below track opinions on various issues related to global warming, separately for Democrats, Republicans, and Independents. They document the growth of the partisan gap and illustrate how it differs across issues, and has grown unevenly over two decades. To begin, we illustrate the percent of respondents in PPRG surveys who identified themselves as Independents (the largest group – about half the country), Democrats (the next largest group – a little more than a quarter of the country), and Republicans (the smallest group – a little less than a quarter of the country). 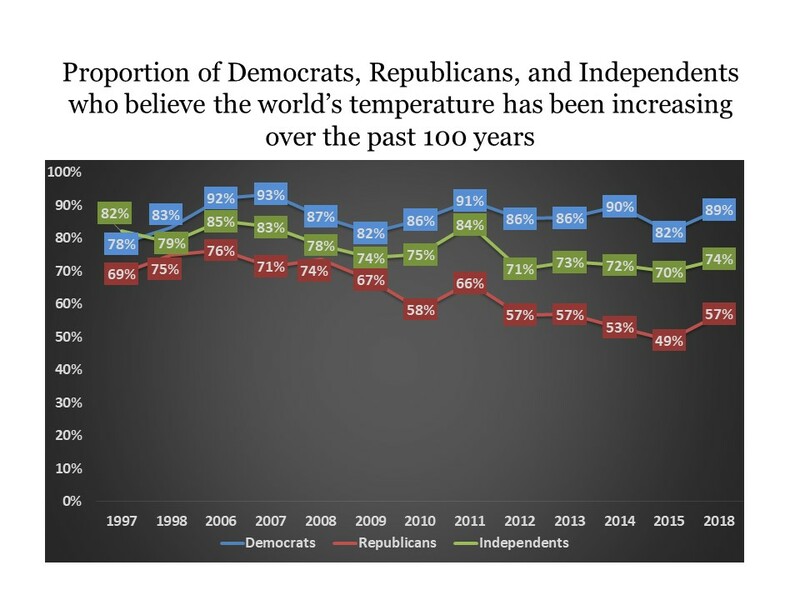 Since 1997, majorities of Democrats, Republicans, and Independents have believed that the earth has probably been warming over the last 100 years (see the figure below). In 2018, 89% of Democrats, 74% of Independents, and 57% of Republicans believed that global warming has been happening. The partisan gap grew from 13 percentage points in 1997 to 32 percentage points in 2018. But the gap has not grown steadily over those years. 2010 marked a point of notable growth, from 15 percentage points the year before to 28 percentage points. There has been no notable growth in the gap during the last 8 years. 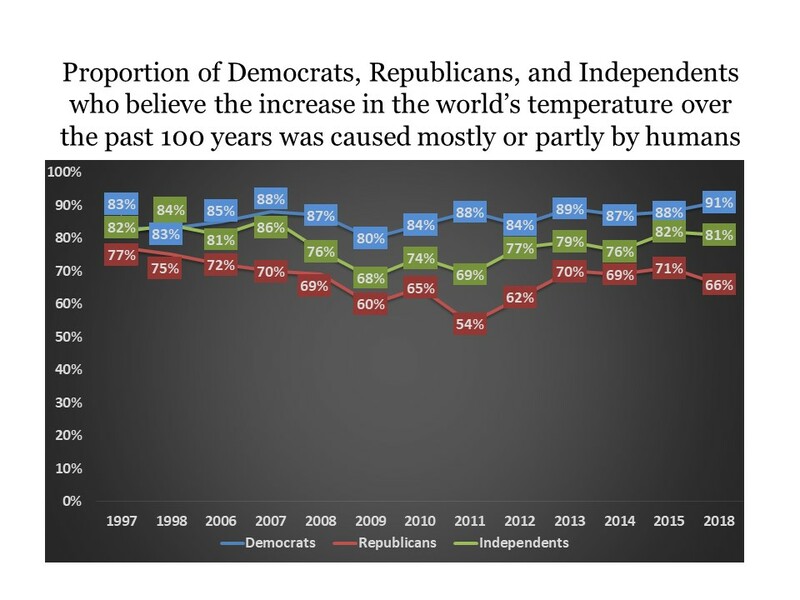 Since 1997, majorities of Democrats, Republicans, and Independents have believed that, if the world’s temperature has increased over the past 100 years, that warming has been caused at least partly by humans (see the figure below). In 2018, 91% of Democrats, 81% of Independents, and 66% of Republicans believed that global warming was attributable to human activities. And again, no notable growth in the partisan gap has occurred since 2011. 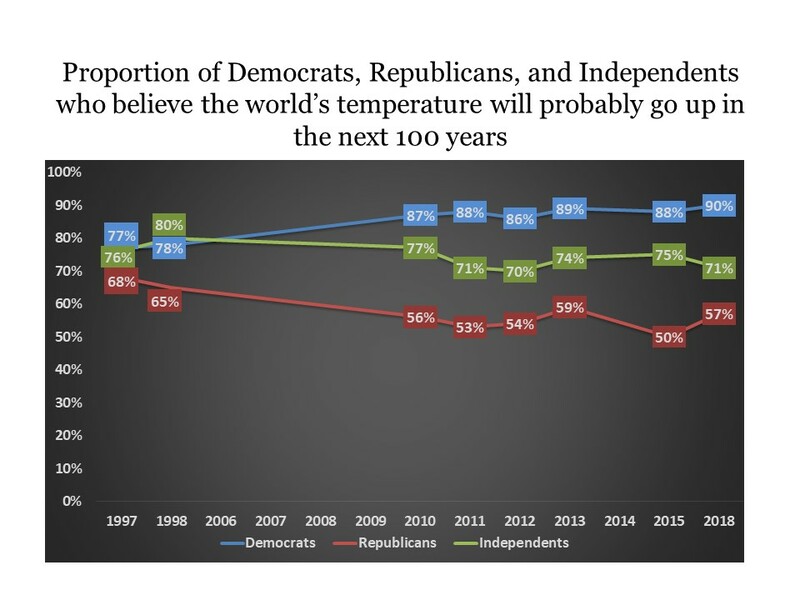 Since 1997, majorities of Democrats, Republicans, and Independents have believed that the earth will probably be warmer 100 years from now if nothing is done to prevent it (see the figure below). In 2018, 90% of Democrats, 71% of Independents, and 57% of Republicans believed that warming will probably continue in the future. No notable growth has occurred in the partisan gap since 2011. 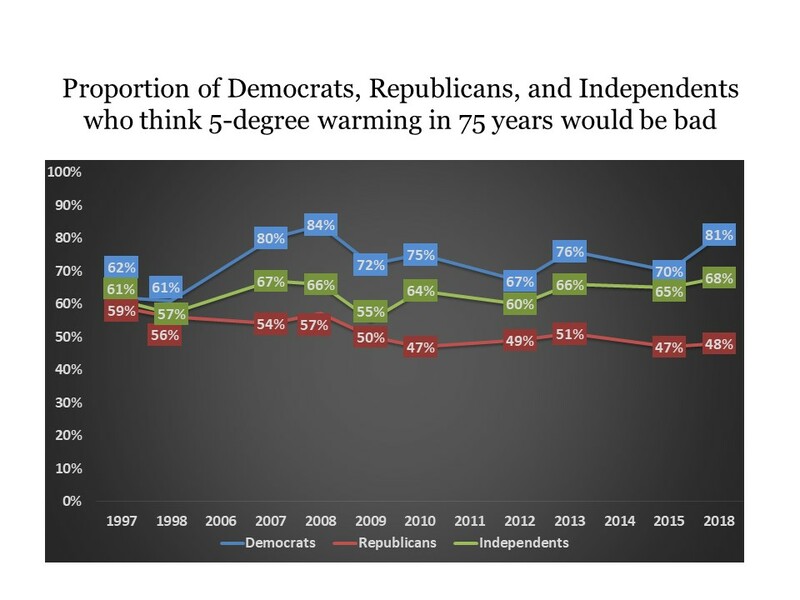 Whereas majorities of Democrats and Independents have believed that 5 degree Fahrenheit warming would be bad, the proportion of Republicans expressing that belief has been just above and below 50% (see the figure below). The partisan gap in 2018 is the biggest observed in the time series: 33 percentage points. 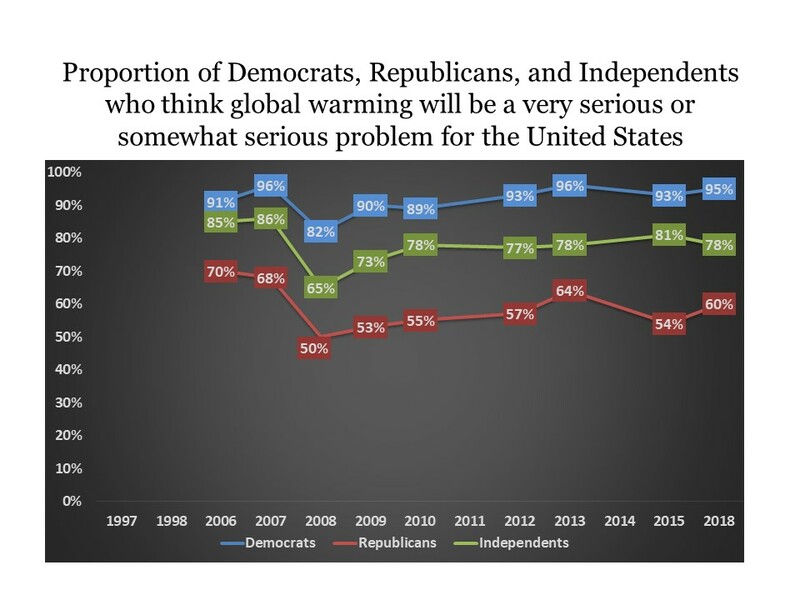 Majorities of Democrats, Republicans, and Independents have consistently believed that global warming will be a very or somewhat serious problem for the U.S. in the future. In 2018, the majorities were 95%, 60%, and 78%, respectively (see the figure below). The partisan gap was 35 percentage points in 2018, about the same as in 2008 and after. 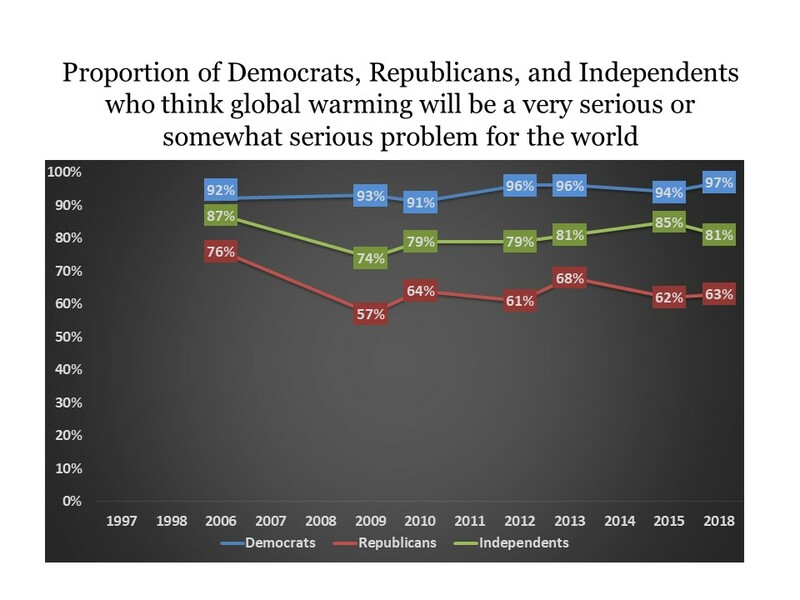 Majorities of Democrats, Republicans, and Independents have consistently believed that global warming will be a very or somewhat serious problem for the world in the future. In 2018, the majorities were 97%, 63%, and 81%, respectively (see the figure below). The partisan gap was 34 percentage points in 2018, about the same as in 2009 and after. 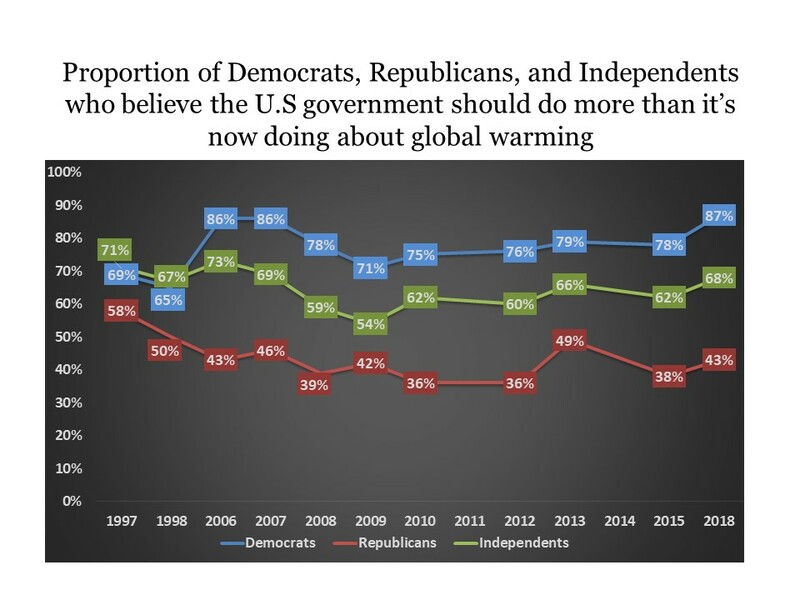 Since 1997, majorities of Democrats and Independents have consistently believed that the federal government should do more about global warming. In 2018, the majorities were 87% and 68%, respectively. Minorities of Republicans have favored increased government action (see the figure below). The partisan gap was 4 percentage points in 2018, about the same as in 2010 and after. 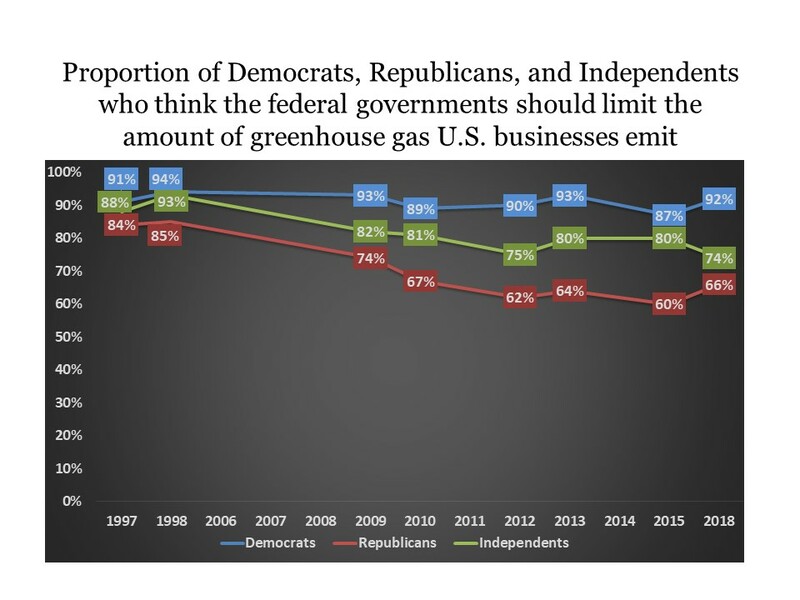 Majorities of Democrats, Republicans, and Independents have consistently believed that the federal government should limit the amount of greenhouse gasses that businesses emit. In 2018, the majorities were 92%, 66%, and 74%, respectively (see the figure below). The partisan gap was 26 percentage points in 2018, about the same as in 2010 and after. 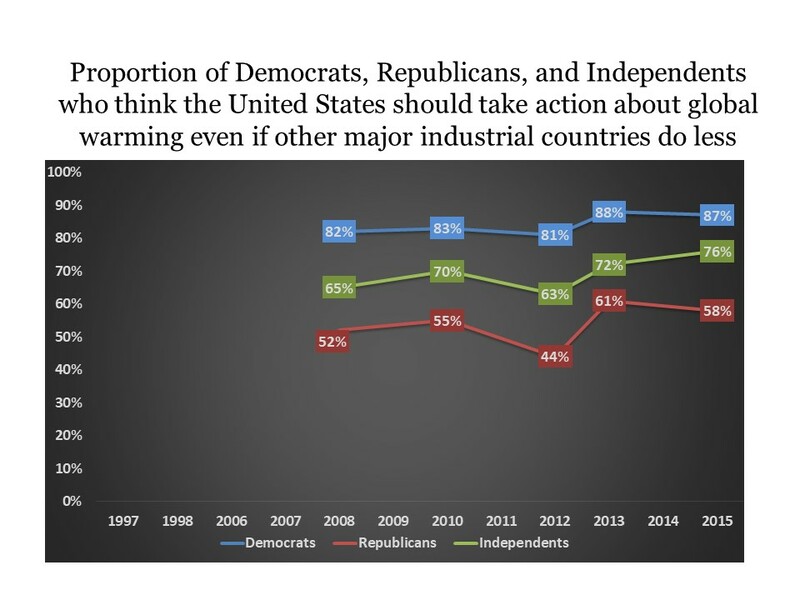 Majorities of Democrats, Republicans, and Independents have believed that the federal government should take action to deal with global warming even if other major industrial countries do not. In 2015, the majorities were 87%, 58%, and 76%, respectively (see the figure below). The partisan gap was 26 percentage points in 2015, about the same as in 2008 and after. 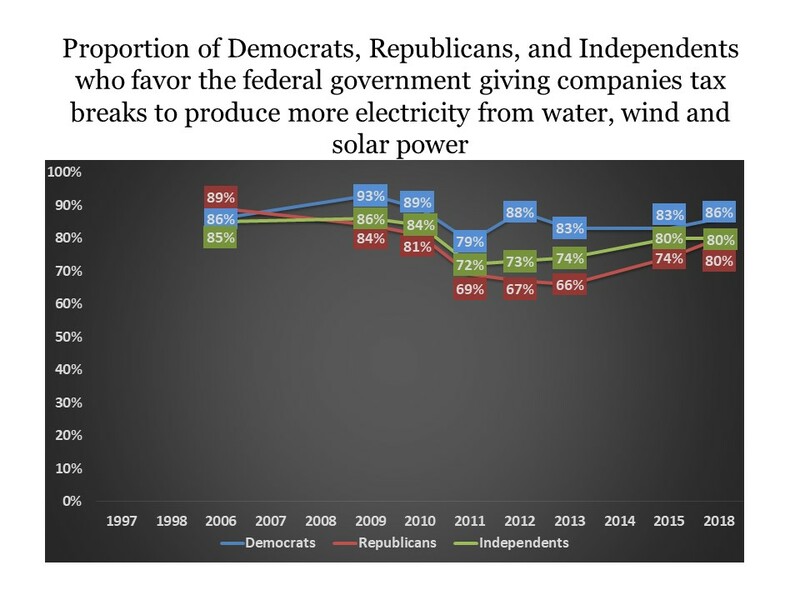 Majorities of Democrats, Republicans, and Independents have consistently favored federal government efforts to cause more electricity to be made from water, wind, and solar power. In 2018, the majorities were 86%, 80%, and 80%, respectively (see the figure below). The partisan gap was a mere 6 percentage points in 2018, about the same as in 2006 and after. Majorities of Democrats, Republicans, and Independents have consistently favored federal government efforts to lower the amount of greenhouse gasses produced by power plants. In 2018, the majorities were 88%, 76%, and 82%, respectively (see the fugure below). The partisan gap was a mere 12 percentage points in 2018, about the same as in 2007 and after. 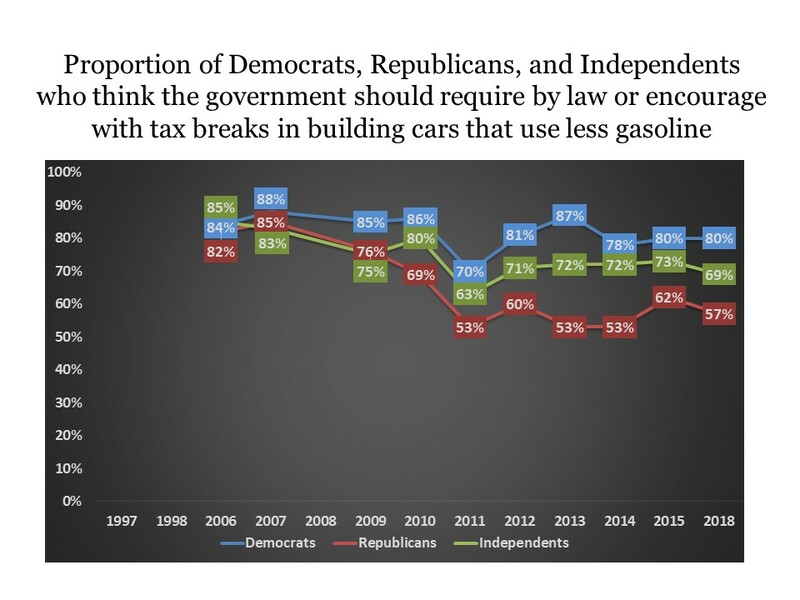 Majorities of Democrats, Republicans, and Independents have consistently favored federal government efforts to cause improvement in fuel efficiency of cars. In 2018, the majorities were 80%, 57%, and 69%, respectively (see the figure below). The partisan gap was 23 percentage points in 2018, about the same as in 2012 and after. 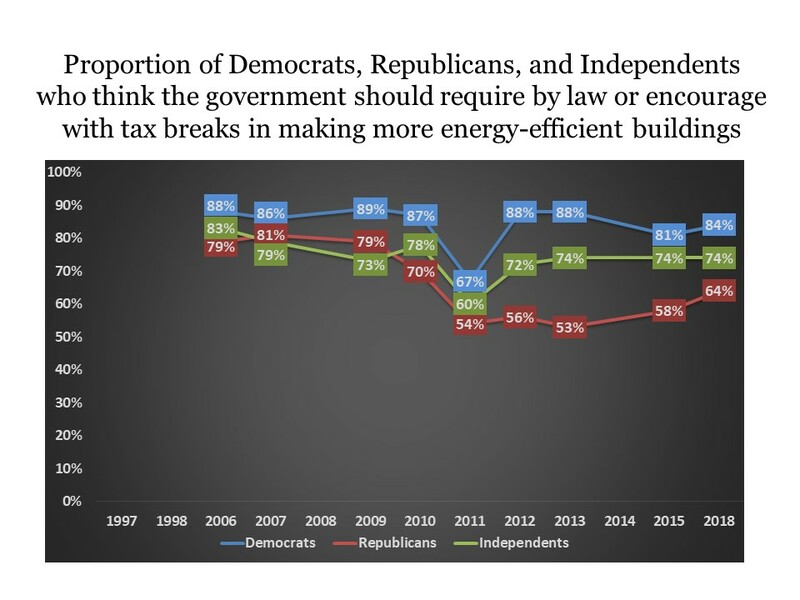 Majorities of Democrats, Republicans, and Independents have consistently favored federal government efforts to improve the energy efficiency of new buildings. In 2018, the majorities were 84%, 64%, and 74%, respectively (see the figure below). The partisan gap was 20 percentage points in 2018, about the same as in 2009 and after. Majorities of Democrats, Republicans, and Independents have consistently favored federal government efforts to cause appliances to become more energy-efficient. In 2018, the majorities were 83%, 62%, and 68%, respectively (see the figure below). The partisan gap was 21 percentage points in 2018, smaller than in 2013. 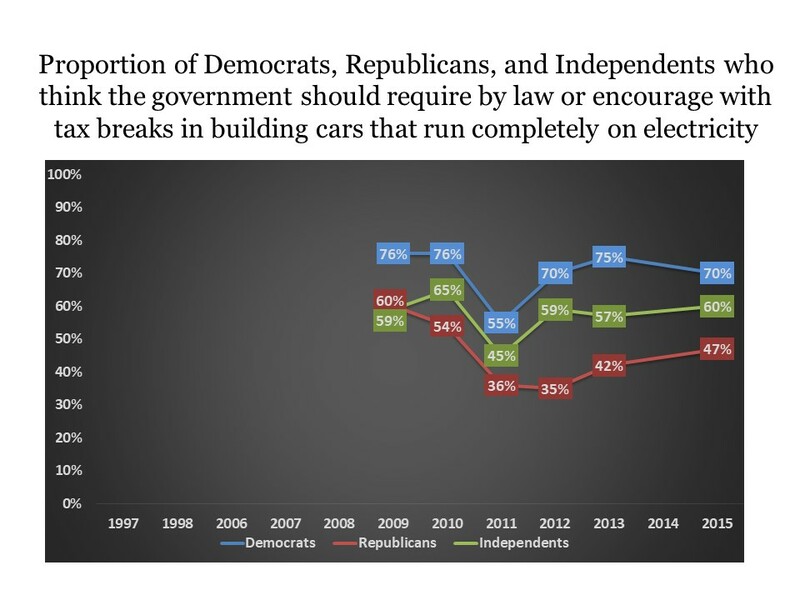 Majorities of Democrats and Independents have consistently favored federal government efforts to cause more cars to be built running completely on electricity. In 2018, the majorities were 70% and 60%, respectively; 47% of Republicans favored this (see the figure below). The partisan gap was 23 percentage points in 2018, about the same as in 2010 and after. 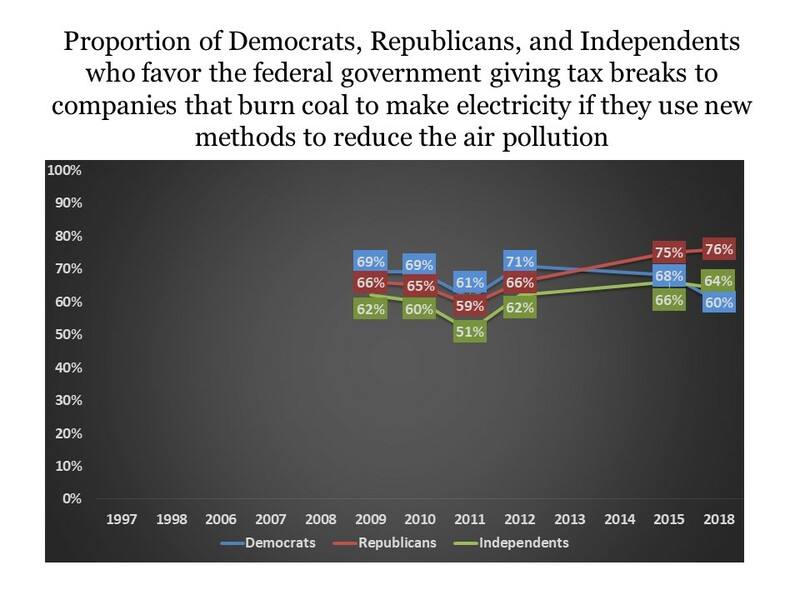 Majorities of Democrats, Republicans, and Independents have consistently favored federal government efforts to encourage reducing air pollution from burning coal. 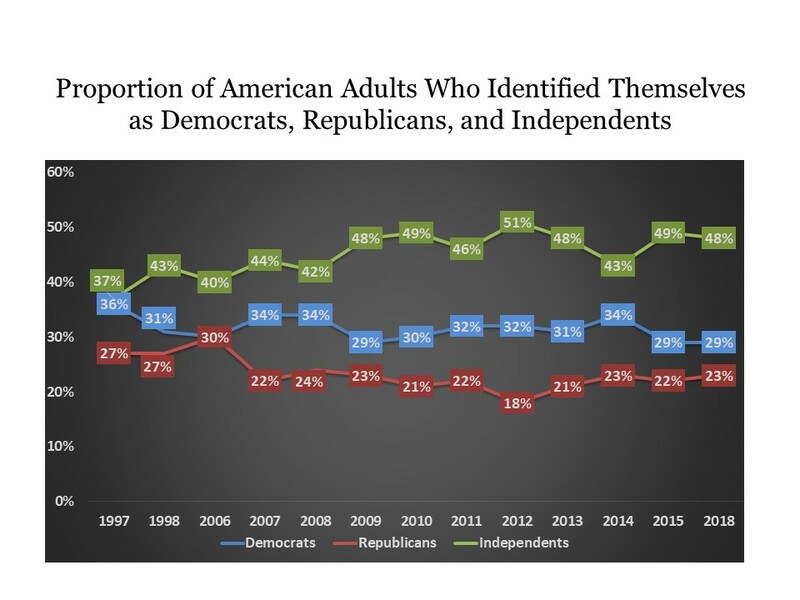 Strikingly, this was most popular among Republicans in 2018 (76%), less popular among Independents (64%), and less popular still (60%) among Democrats (see the figure below). Thus, the partisan gap reversed. 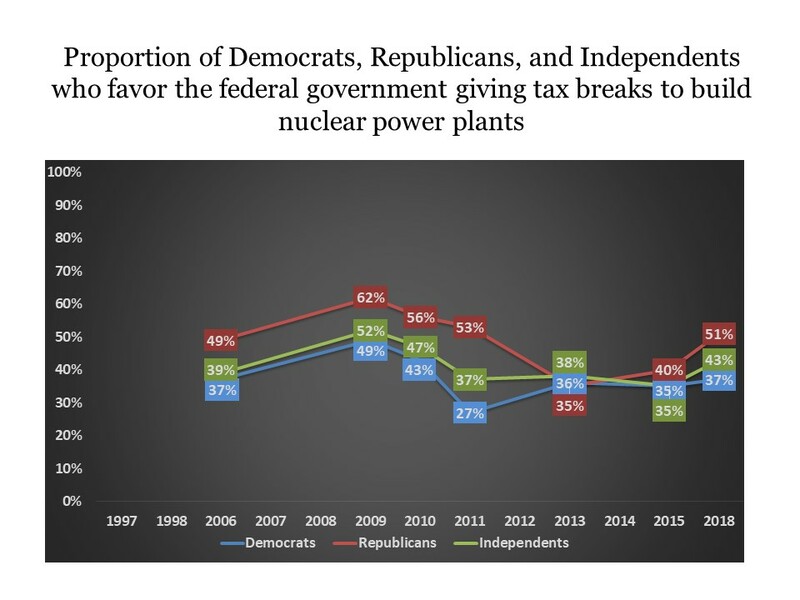 The proportions of Democrats, Republicans, and Independents who favored federal government efforts to provide tax breaks to encourage construction of nuclear power plants have varied above and below 50%. And almost always, Republicans favored these plans more than Democrats and Independents. In 2018, the proportions were 51%, 37%, and 43%, respectively, for Republicans, Democrats, and Independents (see the figure below). The partisan gap was 14 percentage points in 2018, about the same as in 2006 and after. An increase in federal taxes on gasoline to cause people to use less of it have almost never gained majority support. 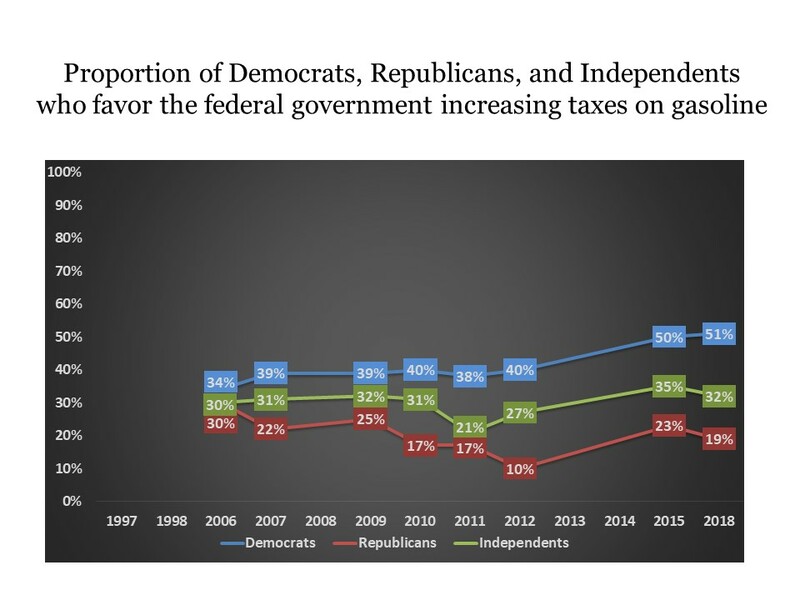 Increased gasoline taxes surpassed 50% among Democrats in 2015 and 2018 (see the figure below). The partisan gap that year was 32 percentage points in 2018. An increase in federal taxes on electricity to cause people to use less of it have never gained majority support. 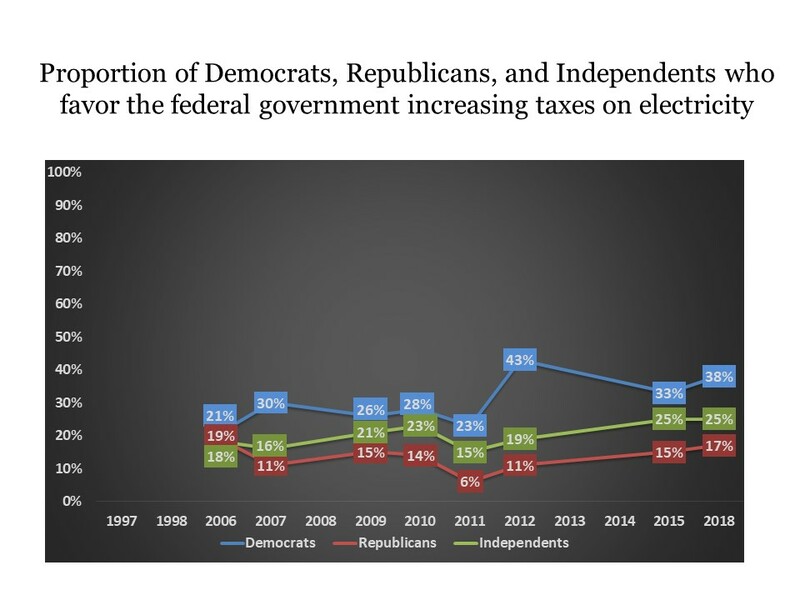 Increased electricity taxes were supported by 38%, 17%, and 25% of Democrats, Republicans, and Democrats in 2018 (see the figure below). The partisan gap that year was 21 percentage points. The proportion of people in the global warming issue public (for whom the issue is extremely personally important) was largest among Democrats in 2018 (34%), 16% among Independents, and 9% among Republicans – a 25 percentage point partisan gap – the largest in the time series (see the figure below). 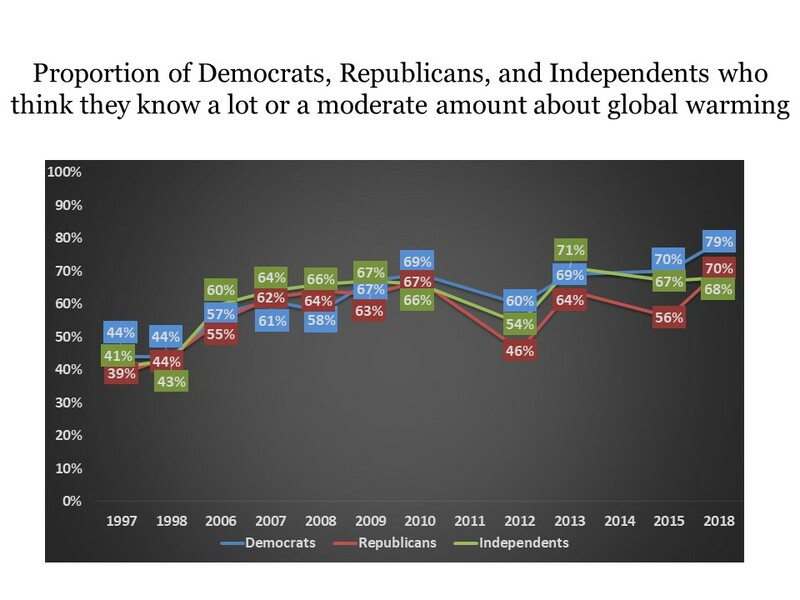 Knowledge about global warming was high among all three groups, higher among Democrats than among Republicans and Independents – a 9 percentage point partisan gap in 2018 (see the figure below). 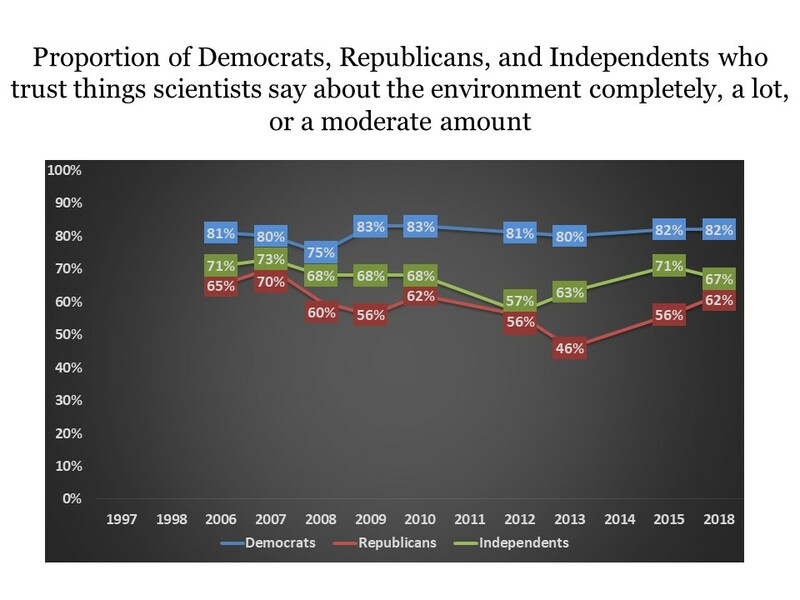 Trust in scientists studying the environment was about the same in 2018 as in 2006 among Democrats (82% and 81%, respectively), among Republicans (62% and 65%), and among Independents (67% and 73%) (see the figure below). The partisan gap was 20 percentage points in 2018 and about the same in 2010.